is credit to the hard work of a dedicated team of coaches and, of course, our enthusiastic and talented students. There has been a key focus on the development of individual core skills at all age groups, allowing players to express themselves and try things on the pitch. a more expansive game type from players and has resulted in some quality play, along with some outstanding tries being scored. Players are now challenged to problem-solve, both in Games sessions and training sessions. This concept gives players the confidence to express themselves, make decisions under pressure and game-manage when representing the School, rather than constantly looking to the side- line for direction. It is fantastic to see so many boys out representing the School on a Saturday, as well as the smiles on faces. year and produced some fine results. However, a special mention must go to our U13A team, who had a fantastic season, winning 10 of their 12 fixtures and producing an 83.3% win percentage – an excellent achievement. 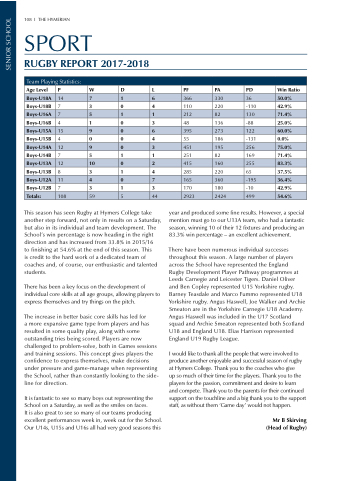 Rugby Development Player Pathway programmes at Leeds Carnegie and Leicester Tigers. Daniel Oliver and Ben Copley represented U15 Yorkshire rugby. Barney Teasdale and Marco Fummo represented U18 Yorkshire rugby. Angus Haswell, Joe Walker and Archie Smeaton are in the Yorkshire Carnegie U18 Academy. Angus Haswell was included in the U17 Scotland squad and Archie Smeaton represented both Scotland U18 and England U18. Elias Harrison represented England U19 Rugby League. up so much of their time for the players. Thank you to the players for the passion, commitment and desire to learn and compete. Thank you to the parents for their continued support on the touchline and a big thank you to the support staff, as without them ‘Game day’ would not happen.